Robert Issahaku Bugri is a gentleman of 29 years from Samini, a village northwest of Langbinsi. Robert is the sixth and last born of his parents. All are boys. Robert is the only son of his parents who had access to formal education; all his five elder brothers joined their father in his farming activities. Robert completed the 3-year Diploma in Basic Education (DBE) University of Cape Coast distance education programme, with support of PAMBE Ghana. 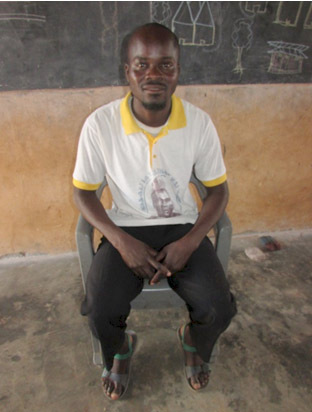 Robert began teaching at the PAMBE Ghana La’angum school in September, 2009. He has taught all the primary classes except P6. He began helping other teachers to guide the KG1 (pre-K) students in his first year, then KG2 (K), and P1 to P5. He is currently the P5 teacher. Robert is married to a young lady by name Felicia Ape with two children Frank and Joana. Frank is a P2 student in LLC. Joana will start school next year. Robert and his wife are true believers in God through the Christian faith. Robert has planted a Church in Bumboazio community, called Grace Community Church. Robert is the lead pastor and goes there every Sunday morning to preach and Wednesday evenings for prayers and thanksgiving. Ten of the LLC students and one teacher are among the members of the church. Robert has so many plans towards the future. He will be adding and updating this biography and sharing as time goes.